However, this week we went along not only to support Mrs View From a Daddy but also to act as volunteer for Parkrun. For anyone who doesn’t know, the event runs on the good will and spirit of volunteers and each weekend hundreds of thousands of people across the globe venture out to complete a 5K run competing against themselves. The perfectly executed event welcomes runners of all abilities making everyone feel welcome. 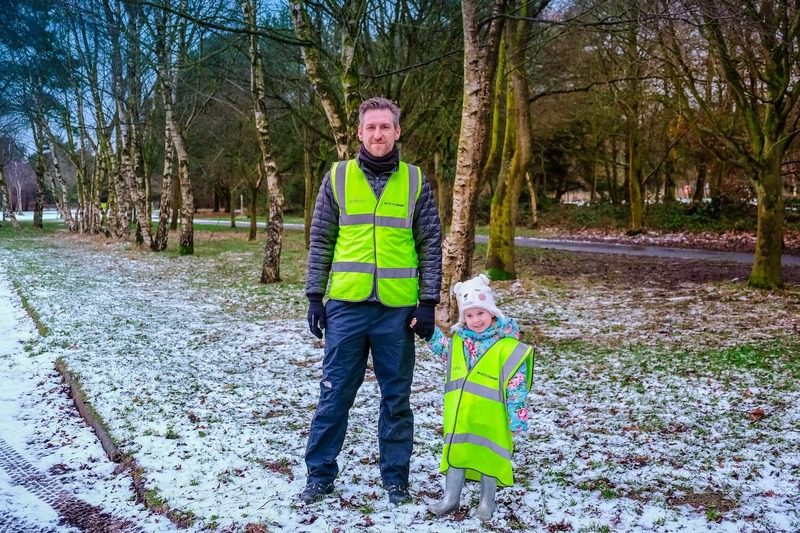 The Little Lady even got in on the action on Saturday sporting a hi-viz jacket to cheer on the hundreds of runners that braved the blizzard that descended just as the crowds set off. Despite the wintry blast, the icy puddles and the muddy route, we had a great morning. Mrs View From a Daddy didn’t get a PB but she got round and under the circumstances she will settle for that. We’ll definitely be volunteering again.